Boeing’s philanthropy has been an inspiration and a roadmap for other local companies to follow. MUCH of our region’s economic strength and robust nonprofit sector can be traced to an important decision made 100 years ago today by a single person. On July 15, 1916, on the shores of Lake Union, Bill Boeing founded what is today The Boeing Company. Boeing easily could have been founded elsewhere. Bill Boeing didn’t grow up or attend school here. A child of Detroit, he attended college on the East Coast. His decision to come to Seattle was originally driven not by airplanes but instead by opportunities closer to the ground, namely his interest in the bustling timber industry of the early 20th century. We still feel the enormous economic and philanthropic repercussions of that decision. Today, Boeing touches virtually every person in our state. Chances are that you have a family member, friend or neighbor who works for the company. That’s because Boeing is the state’s largest private employer, with more than 75,000 employees. Or perhaps you know someone who works at one of the thousands of local suppliers that support the company’s operations. In all, more than 267,000 jobs in Washington, paying a whopping $22 billion in annual wages, depend on the vibrant aerospace industry that has grown up around Boeing. Bill Boeing’s single-engine seaplane, which first glided over Lake Union in 1916, ultimately gave birth to a truly global operation. Boeing sold airplanes worldwide long before Microsoft software enabled a global computing and communications revolution. Before Starbucks sold lattes in China and Amazon brought online shopping to cities around the world, it was Boeing that put our state on the map as a global center for innovation. Equally important measures of Boeing’s impact on our community can be found in the diverse philanthropic contributions of the company and its employees. In 1917, shortly after that first test flight, Bill Boeing made his first charitable contribution to the University of Washington. It was a first step in what would become an admirable long-term commitment to local schools and nonprofits. Boeing and Microsoft enjoy a shared tradition of strong philanthropic activity that began very early in each company’s history, belying the notion that a company has to “grow up” before it can support the community. One great example of Boeing’s generosity is the company’s program that matches corporate donations to employee’s charitable contributions and also provides a per-hour donation to nonprofits where employees volunteer. Boeing, its employees and retirees today contribute annually more than $50 million and 100,000 volunteer hours to more than 200 Washington nonprofits. Their impact through United Way of King County, for example, is huge. They’ve given more than $1 million in recent years to support our early learning programs. They contribute significantly to the Parent Child Home Program, which to-date has benefited 2,500 low-income families. They support a United Way program that helps provide kindergarten readiness support to 3,600 children with developmental delays, and another that assists 2,800 young people in completing their high school equivalency exams and starting careers. Boeing, together with Microsoft, also helped start the Washington Opportunity Scholarship. A $50 million initial contribution split between the two companies helped launch this public/private partnership to support low and middle-income students pursuing degrees in high-demand STEM and health care fields. Boeing’s philanthropy has been an inspiration and a roadmap for other local companies to follow. 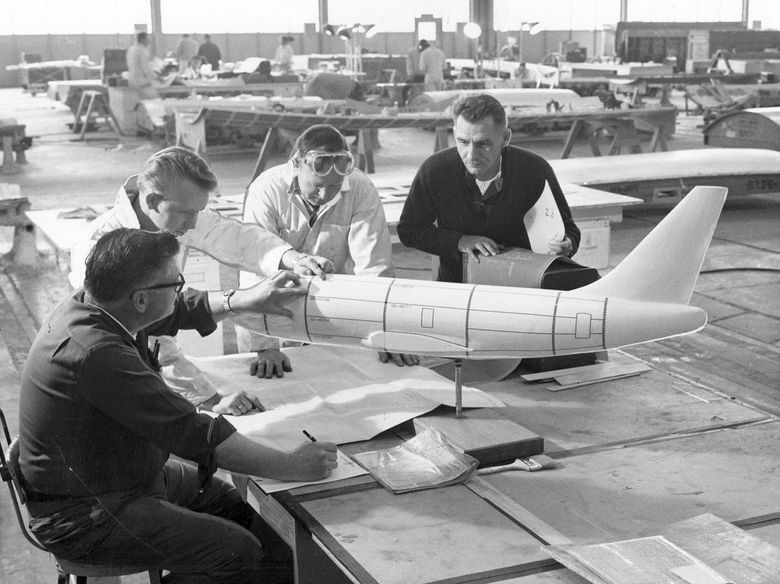 The fact that Seattle is seen today as an international leader in philanthropy can be directly traced to the company’s early dedication and leadership in this arena, which Boeing employees and leaders would build on mightily in the years to follow. On this centennial of Washington’s largest employer, let’s pause to celebrate Boeing’s 100 years as an economic driver for local families, and the company’s commitment to make our community a better place to live. Both are great reminders of why our region is so fortunate to be Boeing’s birthplace. Learn about Boeing’s Centennial at boeing.com/boeing100, and Boeing’s contributions in Washington state, at boeing.com/washington. Brad Smith is president of Microsoft. Jon Fine is president and chief executive officer of United Way of King County.